During the holiday season, a bright outdoor lighting display conveys cheer, welcome and goodwill. Who wouldn’t want one? Despite their best intentions, though, many homeowners don’t have time to put up all the lights and decorations. Christmas adds yet another element of hustle and bustle to people’s already busy lives. If you’d like a dramatic holiday lighting display without the time commitment, GMS has your home covered. We offer a large selection of outdoor decorating options, all with complete setup and takedown service. We do the work. You display the cheer. All our displays use energy-efficient LED bulbs with lifetime guarantees. Lighting options include icicle lights, roofline lighting, pillar lighting, tree lighting, floodlights, and spotlights trained on whatever you want the neighbors to most notice. Our festive materials include a wide variety of wreaths, bows and tree decorating options. Our staff will put it all together so that you have the best, brightest display in Brookfield, Elm Grove or New Berlin. Best of all, we’ll store your lighting and decorations to put up again next year. Imagine approaching the holidays knowing that, because you don’t have to spend endless hours stringing outdoor lights, you’ll have more time with family and friends. After all, isn’t that what the holiday season is really about? 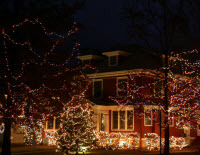 Call or click to receive a quote for holiday lighting for your home.